Yep yesterdays outfit was a doggy extravaganza. I’ve had this top a wee while now and wear him quite often but never capture it for the old blog! excuse my hand this reminds me of “take my strong hand…” Anyone name that film? yes its particularly bad! I really was hankering after a jeans day, i mean, i wear A LOT of dresses and skirts and love it, but then some times i look forward to a nice easy going jeans day. You know, a not going to expose myself with that surprise gust of wind, move freely and not particularly lady like, sit with legs apart kinda day! And it was good. The background colour of the top is what i’d call Champagne. I love that colour, my first mobile phone and camera when i was a teenager was champagne colour. Dont really know what made me think of that, other than i have a penchant for the colour. And seeing as im waffling on i will take that as my cue to wish you all a wonderful, lovely, happy, stressfree, delightful weekend! That’s what i’m gunna *try* and have!! Ps there’s a nominate button up there on the left hand side for those Cosmo awards. I know a lot of bloggers are talking about it (i’m always late on the uptake arent i! ), but if you would like to vote for Rachel The Hat, well that would be grand! voting closes on the 30th i believe. Oh wow you look so amazing! 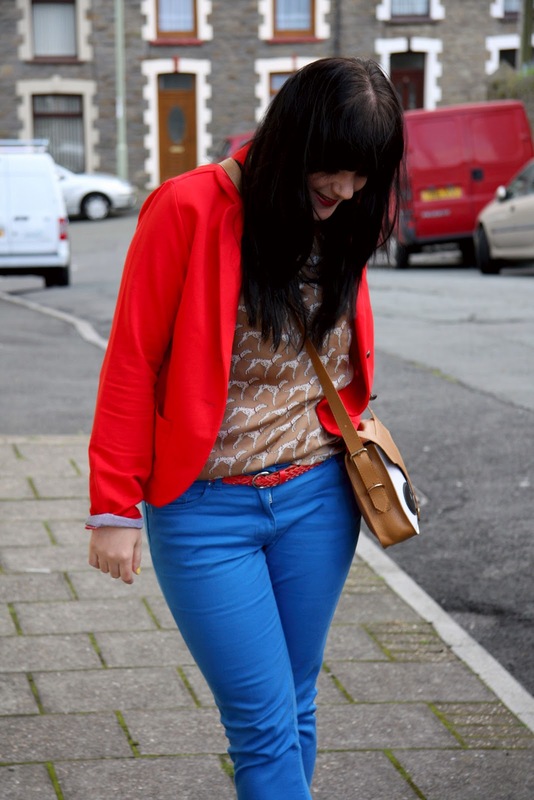 I adore the colour scheme of this outfit! lol my first phone was champagne colour too! 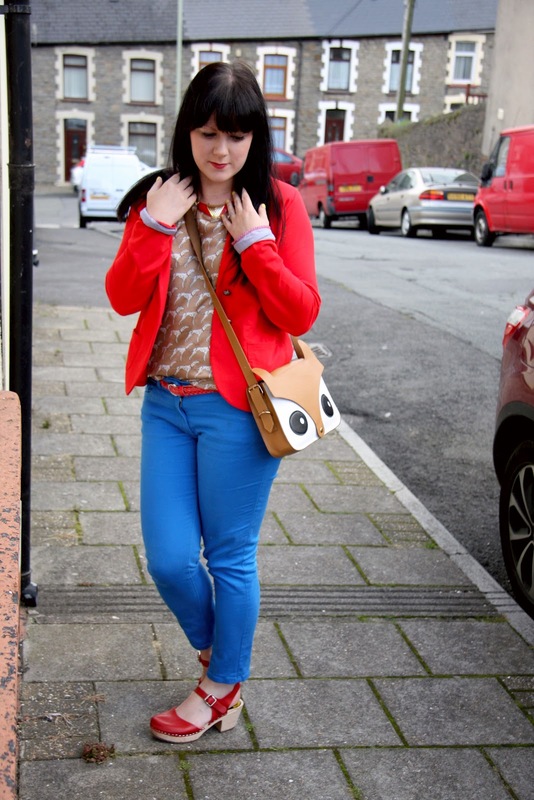 Love that top, looks great with the bright colours! Love this shirt, and the whole outfit together is great. I've had an animal print top or dress on my wish list for a while now but am still looking! 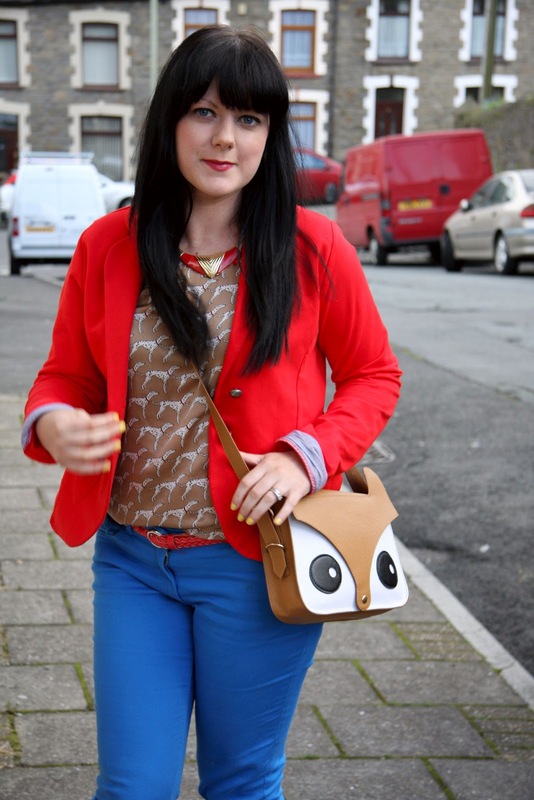 oh red and blue is my alltime favourite colourcombo and like i love dogs i love your shirt as well;) and that fabulous bag! Love this outfit! The colours work beautifully together.